For the last few weeks, a small, family-owned bakery on a highway in Seal Beach, California, has been selling out its entire supply of doughnuts every morning for an incredibly sweet reason. 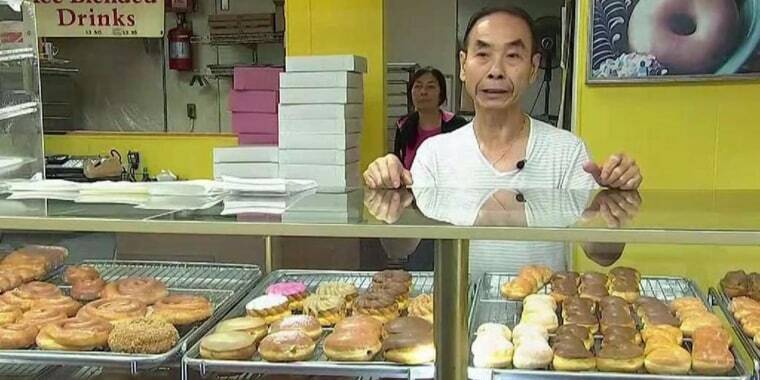 Donut City, a no-frills spot known for its freshly baked treats, was started nearly 30 years ago by husband and wife John and Stella Chhan. They run the cafe seven days a week and, though it's perched beside a 7-Eleven, has a very loyal following of customers who pop in for sweets at modest prices. But on Sept. 22, Stella suffered a "debilitating [brain] aneurysm," the Orange County Register reported, and customers began to notice her absence. Some asked John, 62, if his wife was OK, including a regular named Dawn Caviola who — after learning of Stella's condition — could think of little else. "I went home and I just couldn't get it out of my head," Caviola told NBC News earlier this month. "They are just such hardworking people." After posting an idea to buy out all of the shop's doughnuts to Nextdoor, a social networking site that serves as a platform for local community members, the support (and hunger for doughnuts) rolled in. Donut City usually opens around 4:30 a.m. and usually stayed open until the early afternoon. But with the locals' efforts, John was able to close earlier and earlier — meaning that's he able to go home and spend time with his wife. On the doughnut shop's modest Facebook page, people have been posting about recent trips to the store. On Nov. 3, John told NBC News that Stella was doing much better, could speak again and was re-learning how to eat. That morning, after his inventory was totally sold out, he was able to close the shop at 8:30 a.m. Still, the crowds continue to flock to Donut City and John is able to close earlier and earlier. "I came to Donut City to pick up two dozen donuts for my department. It is 6:30am. They are sold out of donuts. This is crazy," someone posted to Facebook on Tuesday. Many on social media are also praising those who have rallied behind the Chhans. And through several compassionate Facebook share's, it's clear why this doughnut shop has such loyal customers. "BEST DONUTS EVER served by the Sweetest people ever," one local wrote. "The best donuts in the world, the owner is amazing and we are truly blessed to eat and enjoy their donuts," another said. "I used to get dropped off here before elementary school and grab some donuts and walk to school," a grown man commented. "This guy is a complete gem. Always a smile and allllways dropping free donut holes in the bag." Stella and John moved to the U.S. from Cambodia in 1979. They purchased Donut City in 1990 and have been running the business together ever since. After receiving such kindness from his community, John said that he is incredibly thankful — but also hopes to have Stella well-enough to be back in the shop one day soon. "I feel very warm and very happy," he said. "Thank you to everyone."